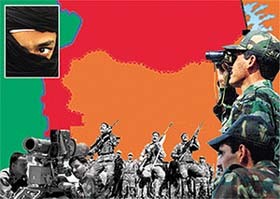 Vajpayee’s exhortations to troops at forward positions have soundly indicated that there cannot be any compromise on the issue of cross-border terrorism and the only defence is offence. The pro-active model had to be activated, says Ashwini Bhatnagar. WITH the Jammu and Kashmir elections barely four months away, political activity in this sensitive state appears to be reviving. The first to seize the advantage, it seems, has been the Awami National Conference headed by veteran G.M. Shah. BLACK buck, known by various regional names, is the most elegant antelope of India. Very few may know that it is exclusive to the Indian subcontinent. Its striking sandy colour and beautiful spiralled horns make it unquestionably the most splendid specimen of the antelopes. AMONG the many therapies recommended and tried is the 5000-year-old Indian system of ayurveda, which of late is becoming increasingly popular with the masses. Even until five years ago even the most brilliant students of Shri Dhanwantri Ayurvedic College, Chandigarh, were not much in demand but now they are being welcomed in the medical field.